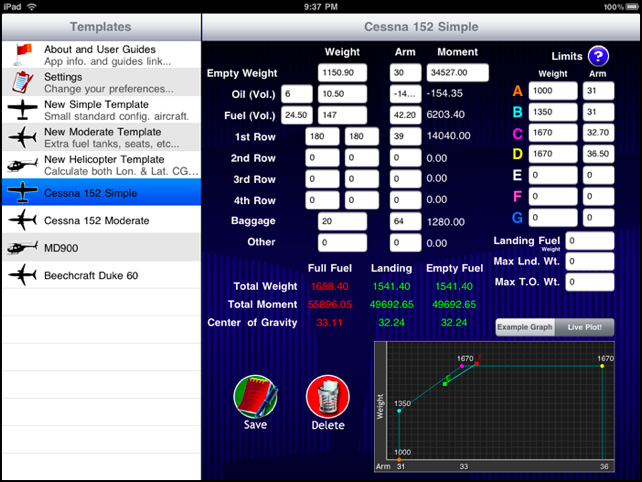 FlightScale is an Aircraft Weight and Balance Graphing Calculator for your iPad! 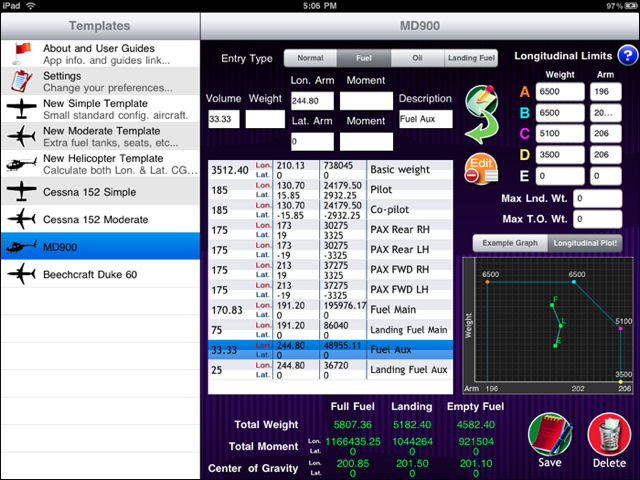 Add your aircraft data, including the envelope limits, and see the weight and center of gravity plot on the live graph! 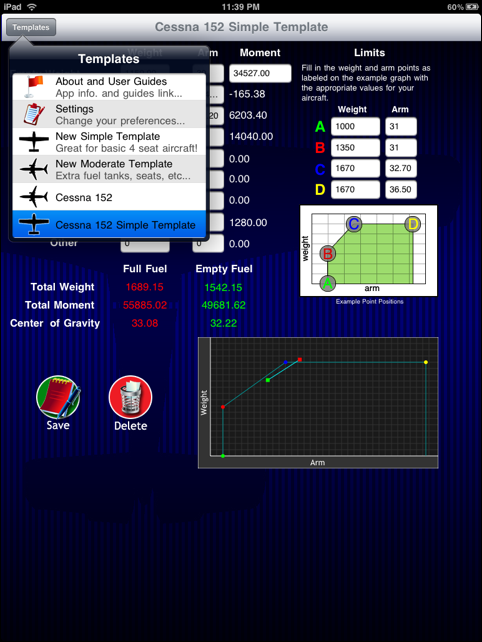 FlightScale will allow you to use up to 26 limit points to create your envelope, and it will plot your full fuel weight/arm, landing fuel weight/arm, and empty fuel weight/arm in the envelope. If you need the limits to utilize more points or to function differently, please contact me through email and I will try to implement any enhancement that you need. Define a Max Ramp, Takeoff, Landing, and Zero Fuel weight. New! Define a utility envelope inside of your normal envelope. 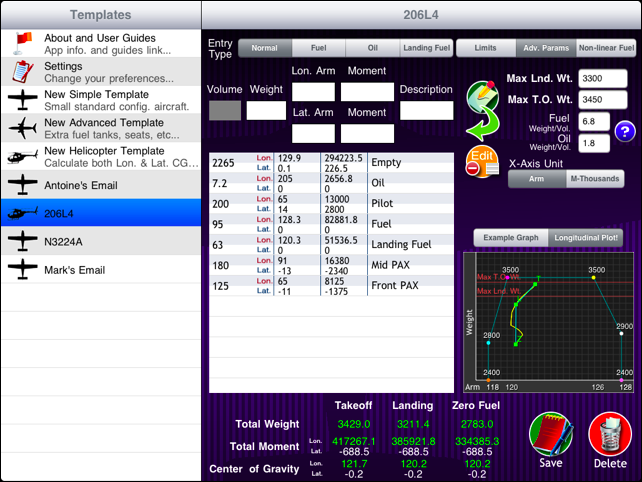 Version 1.4 has brought with it the capability of using and plotting non-linear fuel CGs! I'll be looking for feedback on this system so please shoot me an email if you use it. This application is built to be a stand-alone solution; it will be enhanced and updated but will NEVER require you to purchase “add-on” templates or features. 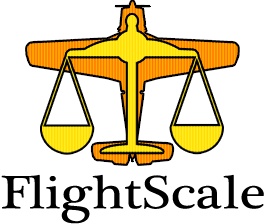 Users of my other aviation solutions will confirm that I frequently bring new functionality to my software and updates are always free. 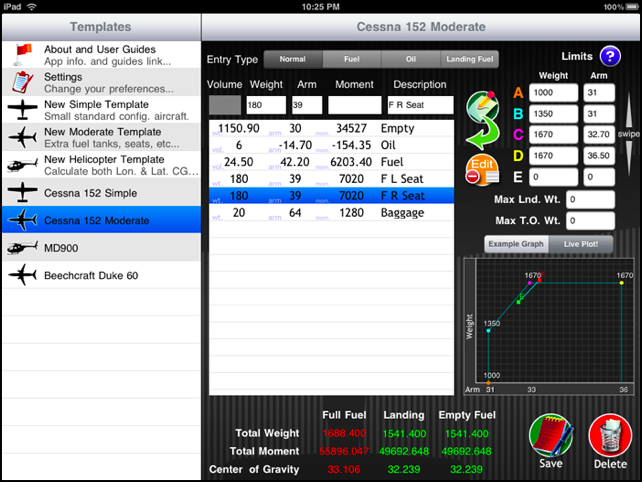 This app is based off of the Weight and Balance functionality of my FlightPlan app for the iPhone, but has been designed from the ground up to perform and display well on the iPad. Introduced in version 1.7 is the email reporting system which will allows you to send yourself (or an employer) a report of your weight and balance calculation. I’m excited to bring this App to the iPad and I’m looking forward to getting user feedback on ways to improve this product. 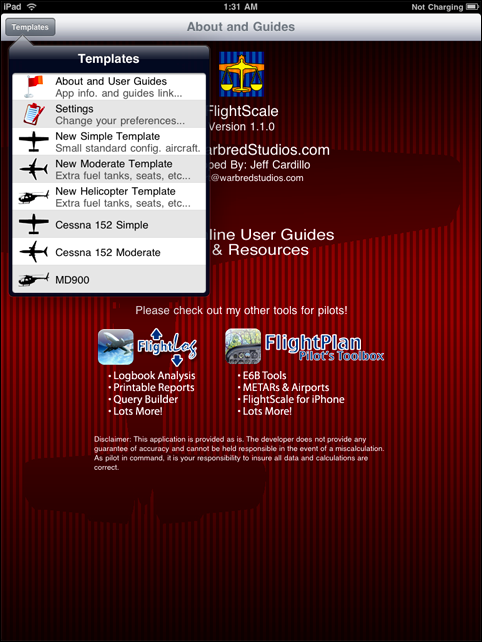 Please visit the website to read about this software and other aviation solutions I’ve developed.